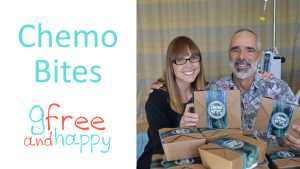 Watch past shows GFree and Happy LIVE from where you are. GFree and Happy is available on your mobile phone, desktop computer, or television set via the videos below, on iTunes, or on Youtube. 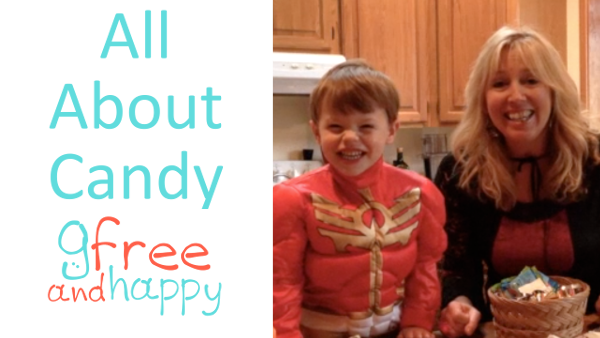 Gfree and Happy’s gift idea for the holidays! 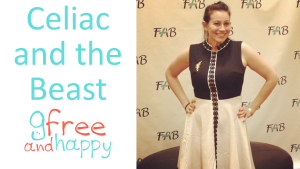 Author Erica Dermer of Celiac and the Beast shares her fun glutenfree experience in her new book Celiac and the Beast. 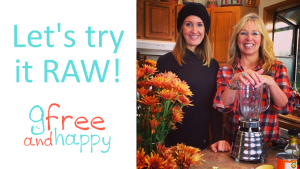 Get with Kathy and Jennifer Jordan from For the Glow (http://fortheglow.com) joins her in the kitchen for GFree and Happy’s 50th episode. And… one more for fun. 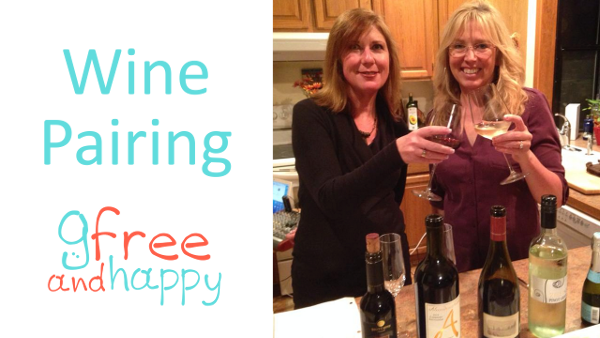 Join Gfree & Happy’s Kathy Nelson and Joleen Green of Match Coffee and Wine in learning about pairing wine and cheese. Find out more behind whether or not wine is gluten free too! Find out what my secrets to a delicious gluten free gravy are! 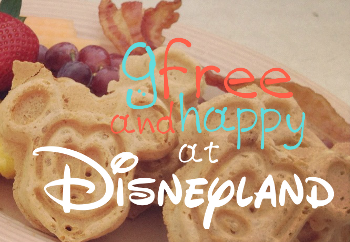 November is Gfree and Happy’s 1 year Anniversary (YA!) and I want to bring to attention tonight how important a “SUPPORT TEAM” can be for someone going through radical changes in your lifestyle. 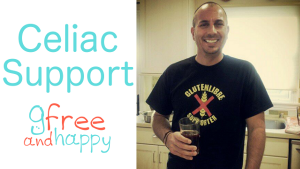 Brian is a “rockstar” in the Celiac/glutenfree community. Two of Brian’s family members have been diagnosed Celiac and he is there to support his family and raise awareness. 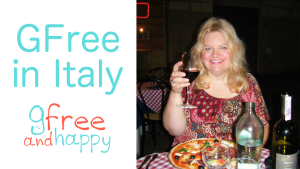 Andrea shares her stories about her Gfree Tour of Italy on this episode of the Gfree and Happy Show. The food, the fun and the wine. Her hotel Villa Casagrande offered gluten free cooking classes too! Check out how fabulous Italy is if you are gluten free! Paula Cooper – Founder and CEO of Dine Aware wanted to create a standard FAI (food allergies and intolerances) language’ for the food & beverage service industry. Dine Aware was created to address the FAI customer’s needs in a way that is super easy for the foodservice industry to adopt. We all want to dine out with friends and family with confidence! Are you a fan of Hopelink here in the Northwest? I am too. Donate to Hopelink here and also enter to win healthy prizes! 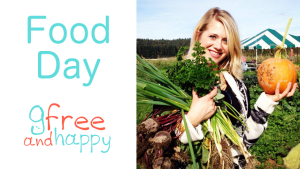 Food Day is a nationwide celebration and a movement toward more healthy, affordable, and sustainable food culminating in a day of action on October 24 every year. Food Day is a chance to celebrate what our food system does right, and take action to bring us closer to a food system with “real food” that is produced with care for the environment, animals, and the women and men who grow, harvest, and serve it. 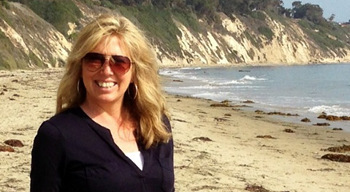 Chef Kirsten Helle is a personal chef, nutrition consultant, and lifestyle and weight management specialist. She is the founder of Mesa de Vida…Table of Life. Ali M. Shapiro – Truce with Food ™ – The Thinker’s Diet – A client described Ali as the swiss army knife of wellness. She is like having the tools of a nutritionist, therapist and personal trainer all working together for you. Truce with Food is a lifestyle change to eating healthy whole foods.